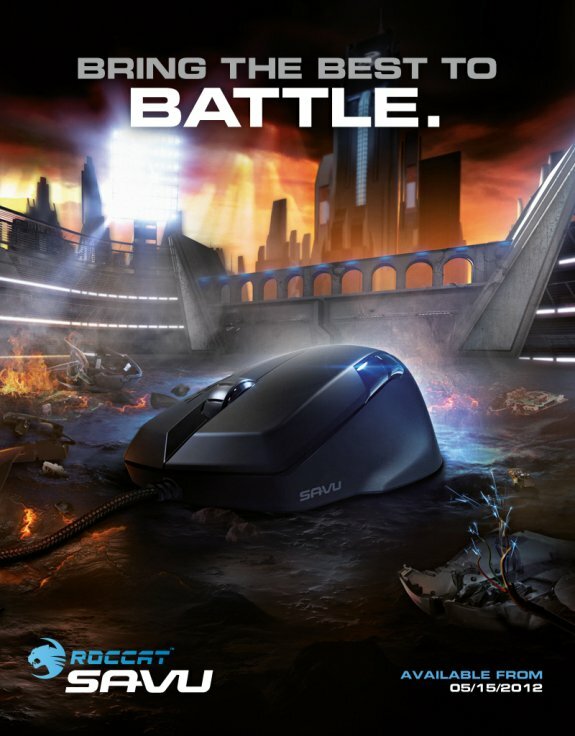 Built to reign supreme as the new titan of optical sensor mice, the Savu comes loaded with the world’s fastest Pro Optic engine and introduces an awards and achievements system to the world of gaming peripherals. Today we are proud to announce the release of the ROCCAT™ Savu Mid-Size Hybrid Gaming Mouse – a competition device that “fusion welds” an ideal blend of performance and customizable features into a robust, perfectly-balanced, medium-size design. The Savu offers a combination of unprecedented true 4000 DPI optical sensor horsepower, world famous Easy-Shift[+]™ technology allowing for advanced button configuration, and a customizable lighting system delivering 16.8 million colors. What’s more, it’s the world’s first mouse to feature a stats and trophy system – called the ROCCAT™ Achievements Display, or R.A.D. – something previously known in similar form only in online gaming. Designed specifically for fans of mid-size gaming mice, the Savu also pampers the hands with an ergonomic right-hand thumb rest and soft-touch surface. From now on the ROCCAT™ Savu Mid-Size Hybrid Gaming Mouse will be available for a MSRP of 59.99 Euro / USD.